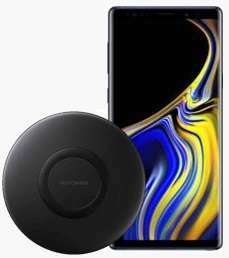 Get the Note9 and a free wireless charger. TODAY ONLY!!! The free wireless charger will be automatically added at checkout. So did I but from a note 8. Garbage build quality returned and got a note 9. What if you don’t post the old phone what can Samsung do ? 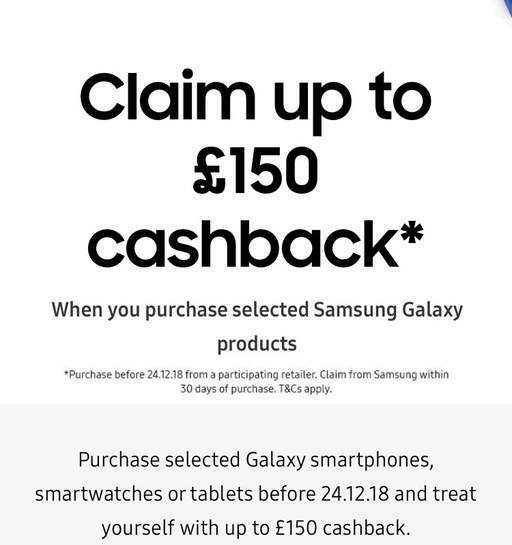 It doesn’t mention anything about the £150 cashback and Samsung have also taken it off their website. 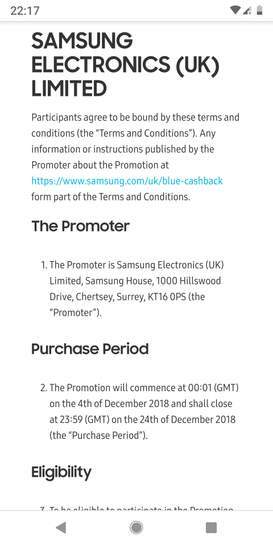 I know part of the T&Cs for the cashback was that the phone was purchased prior to the 24/12/18. Says 24th on samsung website. I also tried to submit a claim for 24th as the purchase date and it works fine. So anyone that order's before midnight should be fine. Well, 'tis the season to be bloated. why do I need earphones. The notch is there for decent facial recognition. Build is great. Camera is excellent. I feel there are some people in the world that just like to follow. 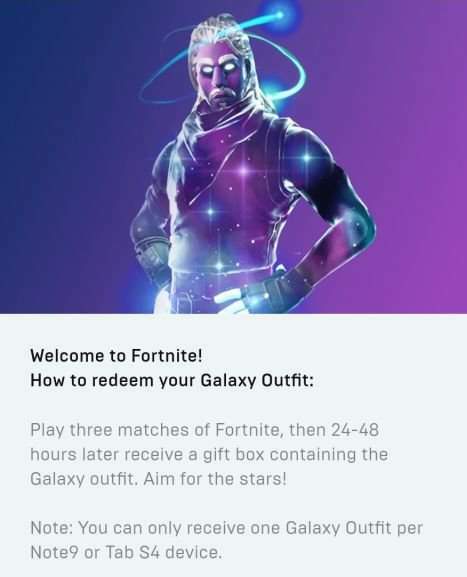 [Image] Says 24th on samsung website. I also tried to submit a claim for 24th as the purchase date and it works …I also tried to submit a claim for 24th as the purchase date and it works fine. So anyone that order's before midnight should be fine. Yeah i used my gf's student discount. Need Unidays account though. Don't know how long that takes to set up. But got both cashback (has been approved) and student discount. We exchanged presents yesterday due to other commitments. So missed out on wireless charger. But still a great deal as I put it through as business expense so get further corporate tax saving off £700 (about £138) bringing cost for me to £411!! Yeah i used my gf's student discount. Need Unidays account though. Don't …Yeah i used my gf's student discount. Need Unidays account though. Don't know how long that takes to set up. But got both cashback (has been approved) and student discount. We exchanged presents yesterday due to other commitments. So missed out on wireless charger. But still a great deal as I put it through as business expense so get further corporate tax saving off £700 (about £138) bringing cost for me to £411!! So you're a student or you're a business? Which are you? N ot a frebbie ! My fiancee is a student. But if you know a student with a Unidays account you have 25 mins to get their login details. The 2nd part requires you to run your own business. I have a few ltd companies so pay corporation tax hence 19% but if you ran it personally you could claim it as a business expense at whatever your prevailing tax rate was up to 45%! Huawei OS is worse, alot of Samsungs is pretty functional, I quite like the Note 9 features. The notch on P20 pro is beneficial if you like pretty much the same usable screen area as a note 8/9 in a smaller device, and there's a headphone adaptor in the box that's tiny enough to stick onto your standard 3.5mm headphones no bother. Battery life also great, but my eyes didn't like the P20s low-res OLED screen, and camera on auto is far worse than Note due to software (despite all the glowing reviews), often underexposing / over sharpening / over saturating / generally messing things up & video was terrible in comparison. There are reasons to avoid P20 pro, but notch & headphone jack aren't good reasons. So P20 pro was nearly great, but I went back to Samsung due to superior screen & camera issues. The notch on P20 pro is beneficial if you like pretty much the same usable …The notch on P20 pro is beneficial if you like pretty much the same usable screen area as a note 8/9 in a smaller device, and there's a headphone adaptor in the box that's tiny enough to stick onto your standard 3.5mm headphones no bother.Battery life also great, but my eyes didn't like the P20s low-res OLED screen, and camera on auto is far worse than Note due to software (despite all the glowing reviews), often underexposing / over sharpening / over saturating / generally messing things up & video was terrible in comparison.There are reasons to avoid P20 pro, but notch & headphone jack aren't good reasons.So P20 pro was nearly great, but I went back to Samsung due to superior screen & camera issues. I know, I'm just winding up, there pretty much isn't a decent modern phone it's all down to personal preference. I love what Samsung does with phones. Do you think Samsung will really come after you if you don’t send in the trade in device and claim the maximum £200 trade in instant discount off the handset? I don’t think they can charge you for this on your original payment method without authorisation. Just a though has anyone tried it? Do you think Samsung will really come after you if you don’t send in the t …Do you think Samsung will really come after you if you don’t send in the trade in device and claim the maximum £200 trade in instant discount off the handset?I don’t think they can charge you for this on your original payment method without authorisation. Just a though has anyone tried it? Yeah. they're all bark and no bite these multi billion corporations It's not like they'll use IMEI blocking and debt recovery as just a few of the options. Apparently if you grab a phone in a shop and run away, they don't have any record of your payment method so shouldn't be able to charge you either. I wouldn't recommend it, but, I'm sure some people have tried it & if it works out, it's the cheapest way of owning a new phone. Being more serious, I expect Samsung would have a way of billing you if you don't send in the trade in, but even if they didn't, it'd basically be theft to accept the discount on the basis of sending in a phone that you then don't send in. Are you really this thick? You have to send the trade in within 7 days of receiving the trade in pack. They have up to 30 days to pay out cashback, so are well entitiled to hold back any cashback till you send the trade in. They also clearly state seeking legal redress if you dont do so. But no, just ask a bunch of randoms on the internet for advice on how to defraud Samsung. i bought the S9 a few weeks ago via the student discount on unidays, applied for the £100 cashback and was knocked back (was advised it states when you apply the student discount any other offers are void). 28 days free returns! i bought the S9 a few weeks ago via the student discount on unidays, …i bought the S9 a few weeks ago via the student discount on unidays, applied for the £100 cashback and was knocked back (was advised it states when you apply the student discount any other offers are void). 28 days free returns! Can you show us the actual email. They haven't said anything like that to me. My claim is still on validated, but not yet paid. Can you show us the actual email. They haven't said anything like that to …Can you show us the actual email. They haven't said anything like that to me. My claim is still on validated, but not yet paid. id already had a successful £50 claim on the galaxy watch from JL and that was received and verified within about an hour or so, payment within 7 working days. Lovely story but the comparison was with the Mate 20 Pro. I much prefer the Note 9 though, it's a fair bit heavier, a bit slower but no OS bugs, no offensive burnt in malware and no stupid notch making the notification bar pointless waste of space.